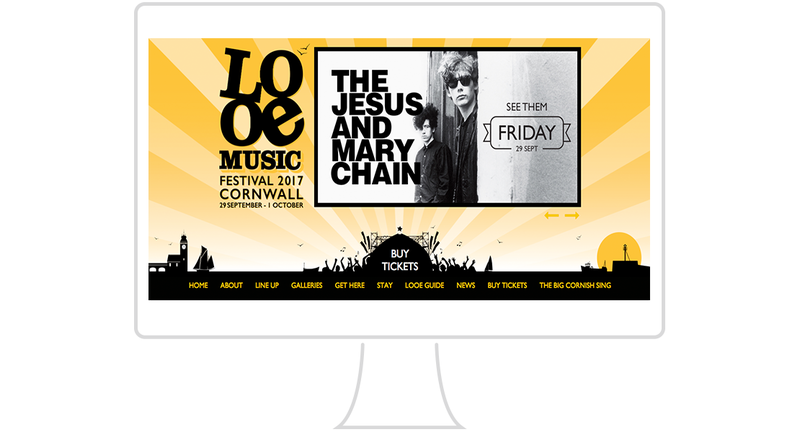 In January 2012, Voice Group were commissioned to create an evolving brand and marketing campaign for Looe Music Festival with a remit to double ticket sales from their first year total of 1700, place Looe at the heart of the brand and connect with a target demographic of tech-savvy, information-hungry 35-50 year olds. Voice Group developed a striking look and feel then rolled it out across all media from t-shirts and pint glasses to posters, flyers, programmes, national print advertising and a brand new mobile friendly website, including a groundbreaking ‘now and next’ mobile minisite that informed visitors of the band schedule in real time throughout the weekend. Bold, sunny messaging with strong calls to action complemented the seaside appeal. From day one, Voice were responsible for ensuring cohesive marketing in all media, writing, designing and monitoring newsletter campaigns, AdWords & SMS campaigns, blogs, radio ads etc. Over the past five years, the results have exceeded all expectations with ticket sales up 500% and LMF established as Cornwall’s favourite festival, attracting major acts from all over the world and winning Best Festival at the WOCAs in 2016 and 2017.